On the surface, Blue Lacuna looks like most other examples of contemporary interactive fiction: a screen full of text, a status bar, and a prompt. You interact with the world by responding to the prompt with a simple declaration: "EXAMINE STATUE", for example. Once you spend any time with it, however, you'll see that this is actually a unique interface. Taking a cue from hypertext authors, Blue Lacuna works on a keyword-based system. Blue words are objects to interact with, green words are places you can go, and bolded words are conversation topics. While the traditional way of playing IF is still viable, it's possible to simply type "statue" instead of the above example. With that small amount of knowledge and the excellently done tutorial system, you're ready to go. Although I've been playing traditional interactive fiction for years, I almost never needed to use a verb to interact with an object, and when I did it was extremely clear what I needed to do. If that weren't enough, at the end of the game's prologue it will assess the choices you made and give you the option to play a story-based game or the more traditional puzzle-based adventure. Rest assured, neither side is missing out; the story-weighted version has the same puzzles, but they're vastly streamlined in comparison to the more traditional fare. Personally, after finishing the game I had a peek at the walkthrough, and if you're not the kind of person who enjoys working out alien linguistics from a few clues, I can heartily recommend the story mode. To those involved with the interactive fiction community, Blue Lacuna's elements have a fairly prestigious heritage: the adaptive hints and keyword-based conversation system evokes Emily Short's Alabaster, the surrealist nature of the story, Andrew Plotkin's Delightful Wallpaper, the deep world and puzzles, Graham Nelson's Curses. More importantly, though, are the things Reed does differently. Analysis: Emergent or branching narratives have been seen as a red herring in game development for a while. Chris Crawford calls them a failure in First Person, the game theory reader. This is mostly because with every choice you implement that drastically affects the story, you essentially double your workload from that point on. In the world of AAA titles, this means exponentially greater costs: after all, with every new conversation comes new models, textures, voice actors, and animations, all of which have to be created by paid talent. 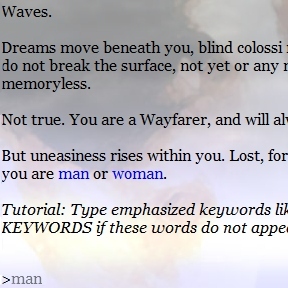 However, with interactive fiction comes the freedom to try such unique approaches to game stories. This is really where Reed excels. After the prologue, you find yourself on a nearly-abandoned island. Your only companion is a mad hermit, a man who talks in broken sentences and shouts at the ocean. Throughout the game, your interactions with him (or even actions in his presence) shape his opinion of you, his relationship with you, and how the eventual ending plays out. Depending on your actions and conversation with this man, the game could play in vastly different ways. He doesn't affect the puzzles themselves, but so much of the incidental dialogue and description of the game is influenced by his mood and relationship with you that it'll end up with an entirely different feel. More than anything else, Blue Lacuna is a game about emotion and memory, and it excels at manipulating both. Blue Lacuna is something unique, as close to 'interactive literature' as I've ever seen in gaming. You owe it to yourself to try it out. Blue Lacuna Walkthrough now available! Sloping Meadow: LANDMARKS, MIDDLE, E, E, OPEN DOOR, E, SE. At the Chasm Floor, if the RED PIPE has steam power, TURN HANDLE. WAIT until it's a staircase. TURN HANDLE. UP. At the Chasm Edge, TURN HANDLE. WAIT until it's a bridge. TURN HANDLE. WEST. GET BERRIES. Inside the Caldera, At the Cinder Cone: LANDMARKS, COLLAPSE, SE, GET BERRIES. Windsigh leaves. You have seven trees to choose from, but only need three. Overgrown Path: LANDMARKS, CLEARING, GET LEAVES. Inside the Treehouse: LANDMARKS, CLEARING, S, UP, GET LEAVES. Inside the Caldera, At the Cinder Cone: LANDMARKS, COLLAPSE, SE, GET LEAVES. Boulder Pile: LANDMARKS, HIVE, S, GET LEAVES. In the Rainforest: LANDMARKS, HIVE, E, S, E, N, GET LEAVES. The Egg: LANDMARKS, HIVE, E, SE, SE, GET LEAVES. On the Saddle: LANDMARKS, HIVE, N, wait until it's low tide. This is usually Midday to early Afternoon, or Evening till most of the Night. From At the Dropoff, DOWN. WEST, WEST. Go UP. You might not find the top yet, that's okay. Just keep trying to go into the WEST tunnel, and going UP, until you reach Top of Cave. From Top of Cave, UP, UP. Get leaves. Among the Boulders: LANDMARKS, CLEARING, NW, SW, GET MUSSELS. Tidepools: LANDMARKS, CLEARING, NW, SW, SW, GET MUSSELS. Top of Ravine:LANDMARKS, HIVE, N, DOWN when the tide is low, W, GET MUSSELS. Hidden Pool: LANDMARKS, MIDDLE, N, NW, E, GET CRYSTAL. Ravine Floor: LANDMARKS, HIVE, N, DOWN when it's low tide, GET CRYSTAL. Viewpoint:LANDMARKS, HIVE, E, N, E, NE, N, GET CRYSTAL. On the Old Lava Flow (aka The Rise): LANDMARKS, MIDDLE, N, NW, WAIT until a SNAIL appears, GET SNAIL. Among the Stumps: LANDMARKS, MIDDLE, N, NW, N, WAIT until a SNAIL appears, GET SNAIL. Ropeway Base Station: LANDMARKS, STATION, WAIT until a SNAIL appears, GET SNAIL. Or: LANDMARKS, MIDDLE, N, NW, N, NW, WAIT until a SNAIL appears, GET SNAIL. Progue will get it for you. Excellent game. I played this back when it came out and I can highly recommend it. The author also created "Whom The Telling Changed", which is basically an interactive telling of the Epic of Gilgamesh: the framing device is that your people are about to make first contact with an invading tribe, and how you direct the story determines whether the encounter ends peacefully or in bloodshed. I highly recommend that one as well. I loved this when it came out. Strongly endorse. If you're on a Mac, make sure you use their version of Spatterlight -- 0.5.0 -- or newer. It won't run on 0.4.9 or lower. This game is great. The writing is beautifully evocative. A word of warning - I typed "save" in the demo and it seized up. 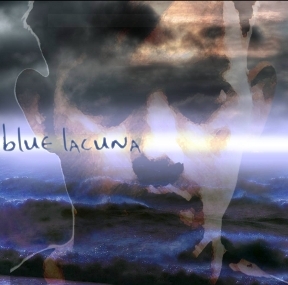 Blue Lacuna remains my favorite work of IF. It's a great game and I'm glad to see it reviewed here! I don't know why, but I can't get the game to play. The READ-ME file says "TO PLAY: simply drag the "BlueLacuna-r3" file onto the "Git" icon." But it won't let me drag any of the icons at all. Gotta see if I can first!! If the supplied instructions don't work, just use common sense. Boot up your Glulx interpreter (I recommend Gargoyle for all your 'terp needs) and open up the game file. I'm not sure about Windows or Linux, but the Mac package comes with (what I assume is) the latest version of Spatterlight. Instead of dragging the file onto Spatterlight like it said, I just opened Spatterlight and clicked on the "Add" button, then selected the ".gblorb" file that contained the IF file. Needless to say, this game was incredible both in content and design. Its keyword method made for infinitely less frustration - I like that it offered a "lite" version, which is great for people just starting out with IF. This is probably the first difficult, in-depth IF game I was able to complete without a walkthrough, which speaks to excellent design (including the subtle in-game hints). This game also reminds me very much of the Myst series - especially Riven - as far as the puzzles, the shifting between worlds, and the "visual" style. With respect to the underlying story it reminds me of Arthur C. Clarke's "The City and the Stars." that you can transmit to both Forest AND City? I guess ultimately, there is no correct choice, because the point of the game is that your own path will always lead you to your own "right" choice. i'd like to know how he coded the interface, as it would help the IF (programmer) community. DuneRunner, he's written an extension for Inform which mimicks the interface. You could take a look at that. if you ask Progue to help you with your departure, and he's submissive enough towards you, he'll ask you to bring him enough berries to make paint. I'm surprised at this game's depth. You get a very different set of experiences if you pursue a romantic relationship with Progue! Take the key again after visiting both cities, but don't set the password to anything (just stand up). Then come down off the mountain. You'll have left it open for both. Just rescued Progue but at night I went out to the big tree and looked at the stars.. but nothing happened.. Went back to the cabin and Progue was gone..
at first I wanted to help both, so I left it blank as the above suggestion.. but nothing has happened so I went to my next preference the tree peopley people and still nothing..
saddle and climb the biggest tree and look at the stars at night? Nothing happens! You need to get to chapter 10 before you can do what you're trying to do. You haven't worked the Pyramid yet to visit the two other worlds, have you? Did you visit all seven windsighs yet? Did you set your two passwords? So I love this game. It's one of the best IFs, though I'm hesitant to say that because it feels like it transcends the genre; it doesn't feel right to compare it with most other IFs, which, while they could be good, awesome or even amazing, feel nothing like Blue Lacuna. I solved every puzzle, had every Progue conversation, had every Windsigh dream, opened the Pyramid, mapped the entire island from the Open Grotto area to the On the Saddle area, helped Progue prepare every paint for my Departure, and generally done everything on Lacuna. tsunami on Chapter 5, but then he disappeared after talking to him at the start of Chapter 6. As in, "follow Progue" or "go to Progue" don't work, and I've explored EVERYWHERE without finding him again. I've saved the shark, seen the new geyser, fixed the head, but no sign of him. I've spent a few days just reading the chirography (writings in Progue's language) around the entire island, but now I can't seem to trigger Chapter 7.
but now how does Chapter 6 transition into Chapter 7? I can't find Progue ANYWHERE! And Progue is almost always the key to advancing the story. In City, at Planter Avenue, an explosion happens that prevents you from getting back into the lab. The door refuses you entry when you try using the passcard. I tried breaking in and bashing the door, but no luck. For anyone who has Windows XP and is stuck on running the game,I had to extract the files, then extract them again.Then I got the 'Git' with its icon (instead of the blank window icon) and then I clicked it.It worked! So I'm guessing if it doesn't work just keep extracting. I'm on chapter 5. The writing is interesting and detailed, but on the other hand, it therefore takes a long time to read. It's been enjoyable so far, but frustrating in some parts. I would like a more complete walkthrough made... Maybe I'll make one after I finish. if you choose to stay with Rume in the beginning (and later go to the island). --all their stories and backstories felt bland. I kept playing because of Progue. He's adorable.